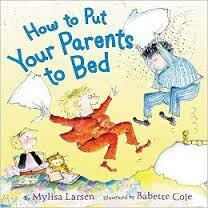 I make no claim that this is an unbiased review: One of my friends, Mylisa Larsen, just wrote a wonderful picture book: How to Put Your Parents to Bed. But you don’t have to believe me—The New York Times loved it, too. Here’s a preview, just to give you a smile. As you can tell, How to Put Your Parents to Bed is a delightful reversal of typical bedtime routines, in which concerned children have to coax parents to stop work, listen to stories, put away their cell phones and get some rest. It is a fine example of flexible thinking as-is, perfect for primary story time. But consider students’ options for creating their own “How To” books. I could easily envision other stories about parents, from a child’s perspective. How about “How To Get Parents to Eat Their Vegetables?” Or “How to Teach Dad to Ride a Bike?” But those aren’t the only options. What about a book from a dog’s perspective, “How to Train Your Human?” I can only imagine a version written by cats! For older students, picture books, including How To Put Your Parents to Bed, offer exceptional studies in word choice and editing. Because children’s books are short, it is easy to envision authors whipping them out in an afternoon—easy, right? Wrong. Picture books are like poetry—because there are few words, each word must be exactly right. Picture books can be the work of years, multiple rewrites and seemingly endless edits. For students, studying picture books can illustrate the impact of a single word or phrase. Writing a seemingly simple story, then examining it—word-by-word—can offer insight into the writer’s craft in ways that could be overwhelming in a longer piece. However you choose to use it, How to Put Your Parents to Bed will make you smile. I can’t wait to see what Mylisa writes next! P.S. If you are quick, you can enter a How to Put Your Parents to Bed contest by April 1 and maybe win some PJs, just for making a comment using #PutParents2Bed. Here are the rules.